Good afternoon my lovely readers!! I would like to share some sweet and exciting news with you all. 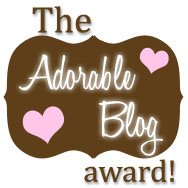 My blogging buddy Schevashea who has a blog called CurvesandConfidence, awarded me The Adorable Blog Award!!!!! (Waves hands in the air like I just don’t care lol). Thank you so so much for choosing me. ASW readers please check out CurvesandConfidence. I love your blog, style and creativity!!! Antonia from Passions on top of passions, she does a great job at styling different outfits and has great blog posts! Jessica from lookatjess.blogspot.com, she has the most uplifting and informative blog posts and is a wonderful mother! Well folks, I hope you all have a wonderful day and thanks for stopping by. I really appreciate it ☺.